Apple now has more liquid cash and marketable securities on hand than the US government, according to financial statements released by the US Treasury on Wednesday. Last week Apple posted their best-ever quarter with $28.57 billion in revenue and a net profit of $7.31 billion. Stock prices soared as the news hit Wall Street with shares topping out at over $400 earlier this week. 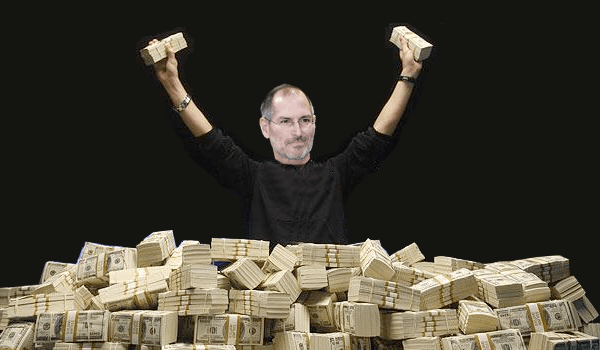 The report shows Apple had $76.2 billion in cash and securities on hand at the end of last month. Compare that to the U.S. government's 73.8 billion in liquid assets and you gain a picture of just how f***ed the country currently is, financially. Currently, the U.S. governement blows through over $10 billion a day –it could easily spend away Apple's $76.2 million in just a week. Add to that the fact that the US government has just been downgraded by the Chinese credit rating agency Dagong Global and you have quite a grim picture of the country's financial future.